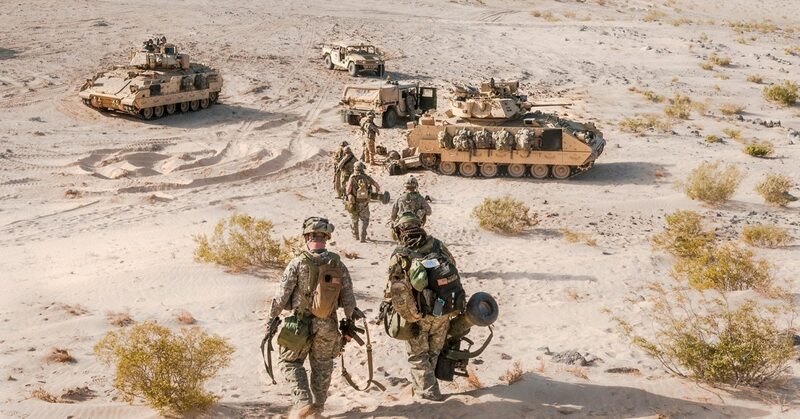 Just as the Army shifted from a division-level focus to “modular” brigade combats teams early in the Iraq war for post-9/11 combat, the service has begun changes to the existing BCTs to pivot back to the near-peer fight. This year will bring more of the changes that have been ongoing in recent years as a Stryker BCT morphs into an armored BCT. The 1st Armored Division’s 1st Brigade Combat Team at Fort Bliss, Texas, will convert from Stryker to armored in 2019. The base of the ABCT relies on the Abrams tank, Bradley Fighting Vehicle and the Paladin artillery piece. And in spring 2020, the 2nd Brigade Combat Team of the 4th Infantry Division at Fort Carson, Colorado, will convert from infantry to Stryker. The new unit revives a legacy of airborne armor that lasted through most of the Cold War. Fort Bliss and Fort Carson won out primarily for two reasons: their extensive training areas and their ability to provide force projection, or deploy rapidly or move equipment to theater, said Lt. Gen. Joseph Anderson, the Army’s deputy chief of staff for operations, or G-3. He said at the time of the announcement that previous thinking looked at a division that included one of each type of brigade combat team — infantry, Stryker and armored. But experience has shown flaws with that model. “What we learned over time was when you tried to deploy BCTs where you only have one like kind on an installation, it’s hard on some of our manning numbers,” Anderson said. Due to training requirements, non-deployable statuses and other factors, individual units from that installation couldn’t always build a full-strength unit to get out the door for the mission, he said. These latest brigade conversions come after last year’s conversion of the 3rd Infantry Division’s 2nd BCT at Fort Stewart, Georgia, from an infantry brigade to an armored brigade. Work to convert these next two BCTs is already underway. The equipment and infrastructure refurbishing and refitting will take an estimated 18 to 24 months. Simultaneously, individual soldier movement, training and, later, unit training to build BCT readiness for combat training center rotations will continue. It also offers some shuffling opportunities for soldiers in those units and job fields. Some soldiers will stay on post and shift to the new units, some new soldiers will come in from the various career courses and initial training. Others may decide to retrain or re-enlist to join the new units. The changes over the past few years and those coming up will put the Army at a total of 31 BCTs in the regular Army, comprised of 11 armored. 13 infantry and seven Stryker brigades once complete. The Army National Guard will hold 27 BCTs, among them five armored, 20 infantry and two Stryker brigades. This gives the total Army 58 BCTs.